The first identified (2009) portrait of Gage, here with his "constant companion for the remainder of his life"—his inscribed tamping iron. Phineas P. Gage (1823–1860) was an American railroad construction foreman remembered for his improbable[B] survival of an accident in which a large iron rod was driven completely through his head, destroying much of his brain's left frontal lobe, and for that injury's reported effects on his personality and behavior over the remaining 12 years of his life, effects so profound that (for a time at least) friends saw him as "no longer Gage". Gage is a fixture in the curricula of neurology, psychology and related disciplines, and is frequently mentioned in books and academic papers; he even has a minor place in popular culture. Despite this celebrity the body of established fact about Gage and what he was like (before or after his injury) is small, which has allowed "the fitting of almost any theory [desired] to the small number of facts we have":290—Gage having been cited, over the years, in support of various theories of the brain entirely inconsistent with one another. A survey of published accounts, including scientific ones, has found that they almost always severely distort Gage's behavioral changes, exaggerating the known facts when not directly contradicting them. Two photographs of Gage, and a physician's report of his physical and mental condition late in life, were published in 2009 and 2010. This new evidence indicates that Gage's most serious mental changes may have been temporary, so that in later life he was far more functional, and socially far better adjusted, than was previously assumed. A social recovery hypothesis suggests that Gage's employment as a stagecoach driver in Chile provided daily structure allowing him to relearn lost social and personal skills. Macmillan writes that Gage may have gained skill with explosives on the family's farms or in nearby mines and quarries,:17-18 and by the time of his accident he was a blasting foreman on railway construction projects. 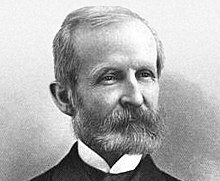 His employers considered him (as town doctor John Martyn Harlow later put it) "the most effi­cient and capable foreman in their employ... a shrewd, smart businessman, very energetic and persistent in executing all his plans of operation", and he had even commissioned a custom-made tamping iron—an iron rod three feet seven inches (1.1 m) long, and ​1 1⁄4 inches (3.2 cm) in diameter—for use in setting charges. Gage was doing this around 4:30 p.m. when (possibly because the sand was omitted) the tamping iron struck a spark against the rock and the powder exploded. The tamping iron was fired out of the hole and "entered on the [left] side of his face... passing back of the left eye, and out at the top of the head." I first noticed the wound upon the head before I alighted from my carriage, the pulsations of the brain being very distinct. The top of the head appeared somewhat like an inverted funnel, as if some wedge-shaped body had passed from below upward. Mr. Gage, during the time I was examining this wound, was relating the manner in which he was injured to the bystanders. I did not believe Mr. Gage's statement at that time, but thought he was deceived. Mr. Gage persisted in saying that the bar went through his head. Mr.G. got up and vomited; the effort of vomiting pressed out about half a teacupful of the brain, which fell upon the floor. The patient bore his sufferings with the most heroic firmness. He recognized me at once, and said he hoped he was not much hurt. He seemed to be perfectly conscious, but was getting exhausted from the hemorrhage. His person, and the bed on which he was laid, were literally one gore of blood. In 1866, Harlow (who had "lost all trace of [Gage], and had well nigh abandoned all expectation of ever hearing from him again") somehow learned that Gage had died in California, and wrote to Gage's family there. At Harlow's request they opened Gage's grave long enough to remove his skull, which the family then personally:6 delivered to Harlow in New England. This is the bar that was shot through the head of Mr Phinehas[sic] P. Gage at Cavendish, Vermont, Sept. 14,[sic] 1848. He fully recovered from the injury & deposited this bar in the Museum of the Medical College of Harvard University. Phinehas P. Gage Lebanon Grafton Cy N–H Jan 6 1850. "The leading feature of this case is its improbability." Harvard's Henry J. Bigelow in 1854. His training predisposed him to minimize Gage's behavioral changes. "I have the pleasure of being able to present to you [a case] without parallel in the annals of surgery." Harlow's 1868 presentation, to the Massachusetts Medical Society, of Gage's skull, iron, and late-life history. Gage certainly displayed some kind of change in behavior after his injury,:12-15 but the nature, extent, and duration of this change are very uncertain: little is reliably known about what Gage was like (either before or after the accident), the mental changes described after his death were much more dramatic than anything reported while he was alive, and the few descriptions which seem credible do not specify the period of his post-accident life to which they are meant to apply. Psychologist Malcolm Macmillan hypothesizes that this change represents a social recovery by Gage over time, citing people with similar injuries for whom "someone or something gave enough structure to their lives for them to relearn lost social and personal skills"—in Gage's case, his highly structured employment in Chile. "Phineas' survival and rehabilitation demonstrated a theory of recovery which has influenced the treatment of frontal lobe damage today. In modern treatment, adding structure to tasks by, for example, mentally visualising a written list, is considered a key method in coping with frontal lobe damage. Phineas job as a stage-coach driver provided that external structure to aid in his recovery. If this is so, Macmillan points out, then along with theoretical implications it "would add to current evidence that rehabilitation can be effective even in difficult and long-standing cases":831—and asks, if Gage could achieve such improvement without medical supervision, "what are the limits for those in formal rehabilitation programs?" Now he drinks, swears, and flies in a rage. Macmillan carries out a comprehensive analysis of accounts of Gage (scientific and popular), finding that they almost always distort and exaggerate his behavioral changes well beyond anything described by anyone who had contact with him. In the words of Barker, "As years passed, the case took on a life of its own, accruing novel additions to Gage's story without any factual basis", and even today (writes historian Zbigniew Kotowicz) "Most commentators still rely on hearsay and accept what others have said about Gage, namely, that after the accident he became a psychopath..."
Phrenologists contended that destruction of Gage's mental "organs" of veneration and benevolence (upper right) caused his behavioral changes. False-color representation of cerebral fiber pathways affected, per Van Horn et al. More recently Sacks refers to the "interpretations and misinterpretations, from 1848 to the present," of Gage. [M]any modern commentators exaggerate the extent of Gage's personality change, perhaps engaging in a kind of retrospective reconstruction based on what we now know, or think we do, about the role of the frontal cortex in self-regulation. The second portrait of Gage to be identified (2010). A compensating reversal[further explanation needed] has been applied in order to show Gage as he appeared in life. In 2009, a daguerreotype portrait of Gage was discovered. It was the first likeness of Gage identified since the life mask taken by Bigelow in late 1849.:22n:ii It shows "a disfigured yet still-handsome" Gage with one eye closed and scars clearly visible, "well dressed and confident, even proud" and holding his iron, on which portions of the inscription can be made out. Authenticity was confirmed in several ways, including photo-overlaying the inscription visible in the portraits against that on the tamping iron in Harvard's Warren Anatomical Museum, and matching the injuries seen in the portraits against those preserved in the life mask. Unlike the Wilgus portrait, which is a daguerreotype, the Miller and Hartley images are 19th-century photographic reproductions of a common original which remains undiscovered, itself a daguerreotype or other laterally (left-right) reversing early-process photograph; here again a second, compensating reversal has been applied. The shirt and tie Gage is wearing in the Miller–Hartley image are different from those seen in the Wilgus image, though he is wearing the same waistcoat in both, and possibly the same jacket. Macmillan compares differing accounts of Gage's life to draw his conclusions. :C:esp.116-19,ch13-14 For over a century, the available sources on Gage's life are few and only included Harlow (1848, 1849, 1868); Bigelow (1850); Jackson (1870);; Jackson (1849). Macmillan's work contradicts Harlow's stated date of Gage's death. :108-9 Harlow (1868) gives the date of Gage's death as May 21, 1861, but undertaker's records show that Gage was buried on May 23, 1860. Macmillan alters certain other dates for events late in Gage's life, his move from Chile to San Francisco and the onset of his convulsions, to account for this discrepancy. ^ a b c d Macmillan (2000):11,17,490-1 discusses Gage's ancestry and what is and isn't known about his birth and early life. Possible birthplaces are Lebanon, Enfield, and Grafton (all in Grafton County, New Hampshire) though Harlow refers to Lebanon in particular as Gage's "native place":338 and as "his home":338 (probably that of his parents) to which he returned ten weeks after the accident. The vital records of neither Lebanon nor Enfield list Gage's birth. 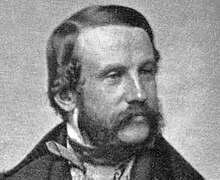 The birthdate July 9, 1823 (the only definite date given in any source) is from a comprehensive Gage genealogy, via Macmillan (2000),:16 and is consistent with agreement, among contemporary sources addressing the point,:389:13:330 that Gage was 25 years old at the time of the accident, as well as with Gage's age—36 years—as given in undertaker's records after his death on May 21, 1860. There is no doubt Gage's middle initial was P:839fig. but there is nothing to indicate what the P stood for (though his paternal grandfather was also named Phineas). Gage's mother's maiden name is variously spelled Swetland, Sweatland, or Sweetland. The reference to Gage's iron as an "abrupt and intrusive visitor" appears in the Boston Medical& Surgical Jouurnal's review of Harlow (1868). ^ Harlow (1848). :393 Macmillan (2000):106-8,375-6 discusses potential reluctance on the part of Harlow, and of Gage's friends and family, to describe Gage negatively while he was still alive, and argues:350-1 that an 1850 communication calling Gage "gross, profane, coarse, and vulgar" was anonymously supplied by Harlow. • See also "Corrections to An Odd Kind of Fame". Cite error: Invalid <ref> tag; name "okf" defined multiple times with different content (see the help page). Cite error: Invalid <ref> tag; name "okf" defined multiple times with different content (see the help page). Cite error: Invalid <ref> tag; name "okf" defined multiple times with different content (see the help page). Cite error: Invalid <ref> tag; name "okf" defined multiple times with different content (see the help page). ^ Campbell, H.F. (1851). "Injuries of the Cranium—Trepanning". Ohio Med& Surg J. 4 (1): 20–24. (crediting the Southern Med& Surg J (unknown date). ^ a b c d e f Barker, F.G.II (1995). "Phineas among the phrenologists: the American crowbar case and nineteenth-century theories of cerebral localization". JNeurosurg. 82: 672–682. PMID 7897537. Bigelow, Henry Jacob (July 1850). "Dr. Harlow's Case of Recovery from the Passage of an Iron Bar through the Head". Am J Med Sci. 20: 13–22. Reproduced in Macmillan (2000). Harlow, John Martyn (1868). "Recovery from the Passage of an Iron Bar through the Head". Publ Massachusetts Med Soc. 2: 327–347. Macmillan, Malcolm B. (2008). "Phineas Gage—Unravelling the myth" (PDF). The Psychologist. British Psychological Society. 21 (9): 828–831. A. 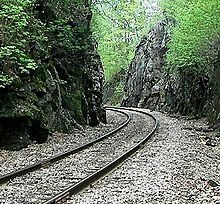 "Phineas Gage Sites in Cavendish". B. "Phineas Gage: Unanswered questions". D. "Corrections to An Odd Kind of Fame". E. "Phineas Gage: Psychosocial Adaptation". F. "Phineas Gage and Frontal Lobotomies". ^ a b Smith, William T (1886). "Lesions of the Cerebral Hemispheres]". TVermont Med Soc for the Year 1885. pp. 46–58. ^ Sutton, W.L. (1850). "A Centre Shot". Boston Medical & Surgical Journal. 3: 151–2. ^ a b c Jackson, J.B.S. "A Descriptive Catalog of the Warren Anatomical Museum". |chapter= ignored (help) Reproduced in Macmillan (2000), in which see also p.107. ^ Jewett, M. (1868). "Extraordinary Recovery after Severe Injury to the Head". Western Journal of Medicine. 43: 241. ^ "Medical Intelligence. Extraordinary Recovery". Boston Medical& Surgical Journal. 3n.s. (13): 230–1. April 29, 1869. ^ a b "Bibliographical Notice". Boston Medical& Surgical Journal. 3n.s. (7): 116–7. March 18, 1869. ^ "Horrible Accident". Boston Post. September 21, 1848. ^ a b Harlow, John Martyn (1849). "Medical Miscellany (letter)". Boston Med& Surg J. 39: 507. Reproduced in Macmillan (2000). ^ a b Damasio, H.; Grabowski, T.; Frank, R.; Galaburda, A.M.; Damasio, A.R. (1994). "The return of Phineas Gage: Clues about the brain from the skull of a famous patient". Science. 264 (5162): 1102–1105. doi:10.1126/science.8178168. PMID 8178168. ^ a b Hockenbury, Don H.; Hockenbury, Sandra E. (2008). Psychology. p. 74. ISBN 978-1-429-20143-8. Macmillan, Malcolm B.; Lena, M.L. (2010). "Rehabilitating Phineas Gage". Neuropsychological Rehabilitation. 20 (5): 641–658. doi:10.1080/09602011003760527. PMID 20480430. ^ a b Ratiu, P.; Talos, I.F. ; Haker, S.; Lieberman, D.; Everett, P. (2004). "The Tale of Phineas Gage, Digitally Remastered". Journal of Neurotrauma. 21 (5): 637–643. doi:10.1089/089771504774129964. PMID 15165371. ^ a b Ratiu, P.; Talos, I.F. (2004). "The Tale of Phineas Gage, Digitally Remastered". New England Journal of Medicine. 351 (23): e21. doi:10.1056/NEJMicm031024. PMID 15575047. ^ a b Van Horn, J.D. ; Irimia, A.; Torgerson, C.M. ; Chambers, M.C. ; Kikinis, R.; Toga, A.W. (2012). "Mapping Connectivity Damage in the Case of Phineas Gage". PLoS ONE. 7 (5): e37454. doi:10.1371/journal.pone.0037454. PMC 3353935. PMID 22616011. ^ a b c d Kotowicz, Z. (2007). "The strange case of Phineas Gage". History of the Human Sciences. 20 (1): 115–131. doi:10.1177/0952695106075178. ^ Austin, K.A. (1977). A Pictorial History of Cobb and Co.: The Coaching Age in Australia, 1854–1924. Sydney: Rigby. ISBN 0-7270-0316-X. ^ a b Fleischman, J. (2002). Phineas Gage: A Gruesome but True Story About Brain Science. ISBN 0-618-05252-6. Macmillan, Malcolm B. (July 2009). "More About Phineas Gage, Especially After the Accident". Retrieved July 27, 2013. ^ Stuss, D.T. ; Gow, C.A. ; Hetherington, C.R. (1992). "'No longer Gage': Frontal lobe dysfunction and emotional changes". Journal of Consulting and Clinical Psychology. 60 (3): 349–359. doi:10.1037/0022-006X.60.3.349. PMID 1619089. ^ a b Fuster, Joaquin M. (2008). The prefrontal cortex. Elsevier/Academic Press. p. 172. ISBN 0-12-373644-7. ^ Sacks, Oliver (1995). An Anthropologist on Mars. pp. 59–61. ISBN 0-679-43785-1. OCLC 30810706. ^ Dupuy, Eugene (1877). "A critical review of the prevailing theories concerning the physiology and the pathology of the brain: localisation of functions, and mode of production of symptoms. PartII". Med Times& Gaz. II: 356–8. ^ Ferrier, David (1878). "The Goulstonian lectures of the localisation of cerebral disease. LectureI (concluded)". Br Med J. 1 (900): 443–7. ^ Sizer, Nelson (1888). Forty years in phrenology; embracing recollections of history, anecdote, and experience. New York: Fowler& Wells. ^ Kihlstrom, J.F. (2010). "Social neuroscience: The footprints of Phineas Gage". Social Cognition. 28 (6): 757–782. doi:10.1521/soco.2010.28.6.757. ^ Carlson, N.R. (1994). Physiology of Behavior. p. 341. ISBN 0-205-07264-X. ^ Twomey, S. (January 2010). "Finding Phineas". Smithsonian. 40 (10): 8–10. ^ Wilgus, B.&J (2009). "Face to Face with Phineas Gage". Journal of the History of the Neurosciences. 18 (3): 340–345. doi:10.1080/09647040903018402. PMID 20183215. ^ a b c Lena, M.L. ; Macmillan, Malcolm B. (March 2010). "Picturing Phineas Gage (invited comment)". Smithsonian. p. 4. ^ Wilgus, B.&J. 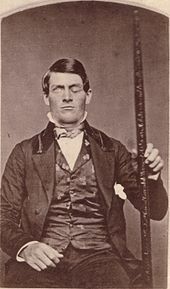 "A New Image of Phineas Gage". Retrieved March 10, 2010. ^ Jackson, J.B.S. (1849). Medical Cases. 4 (Case 1777). Missing or empty |title= (help) Countway Library (Harvard Univ.) Mss., HMSb72.4. ^ Volume 3: Lone Mountain register, 1850-1862, Halsted N.Gray – Carew& English Funeral Home Records (SFH 38), San Francisco History Center, San Francisco Public Library. p. 285. Wikimedia Commons has media related to Phineas Gage. Meet Phineas Gage—The story of how the owners of the 2009-identified daguerreotype learned it depicted Gage.